Now here is the rest of the post. This all took place in that yada-yada’d area of the first Sichuan post. I began by preparing my string beans—stacking them on one end, slicing off the ends, and doing the same to the other end, then cutting them in half. I hadn’t been terribly excited about this recipe, but I wanted a vegetable side dish that went with the dan dan noodles. Then, once I opened the bag of green beans, I suddenly remembered how much I love them raw. I ate a few; I love the crunch, the watery sweetness? That they taste green and of dirt. I have half a pound left and I hope they don’t go bad. Then I sliced my mini-shiitakes, first pulling the stems out (not sure if that’s necessary, but they always seem slightly gross). I should have washed them or wiped them with a wet paper towel, but I didn’t do either. There’s a lot of controversy. Then I read the recipe again and realized I had to rehydrate my shrimp. So I sat around for a while. 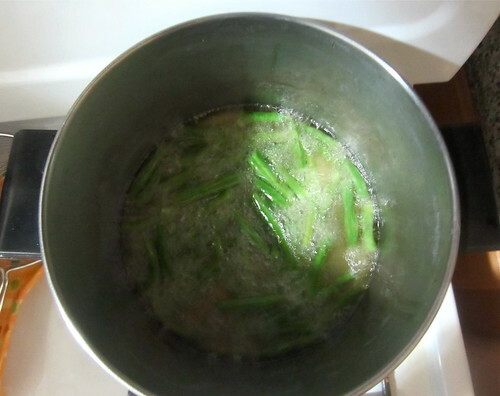 Then—still during the rehydrating—I heated the oil in my larger pasta pot and, once a string bean I added began to sizzle, added about half the string beans. They sizzled away for about four minutes, after which time I thought they were shriveled enough to be considered done. It’s hard to photograph green beans sizzling in oil. I drained them in my colander on the suggestion of Use Real Butter. By then I figured the shrimp bits were hydrated enough, so I chopped them into smaller bits (they were still rather tough, but I have no idea what they’re supposed to end up like, texturally) and diced more preserved mustard greens. I like to think that the title of this post means not that I am unsure about the spelling of Sichuan/Szechuan or whether the food I’ve made this week is either of them; but rather, that I do in fact think. I spent several hours today trying to avoid going to Chinatown to buy groceries for this week’s dinners. First I went to Katagiri, where I bought shiitake mushrooms. 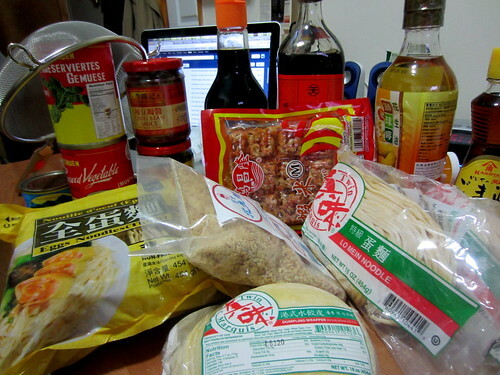 Then I went to H-Mart, where I bought absolutely nothing. Then I gave up and went home. Then I went to Hong Kong Market in Chinatown, where I spent at least one blissful hour (I mean all the time I spent there was blissful; I don’t know how much of it there was) perusing and then buying ingredients that I needed both for these dishes and then just generally for my life. I bought some things I have been needing for like a year. It was great. And Chinatown wasn’t even stressful. I guess I usually go there at bad times, but today it wasn’t crowded, it was peaceful; maybe Hester Street is just calmer. I was in Little Italy, according to the giant flying signs and flags, but everything was Chinese. I bought kind of a lot of things. A strainer; two types of preserved vegetables (both mustard greens, I think; note how the label is in German); chili bean sauce; fermented black bean paste; black vinegar; rice wine (SCORE); peanut oil; sesame oil (just for backup); two types of Chinese egg noodles; dried shrimps; peanut meal (ingredients: Fancy Peanuts); dumpling wrappers. 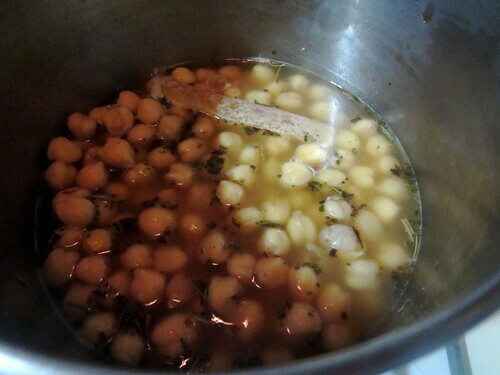 Drain a can of chickpeas; add one cup of chicken broth (or half a bouillon cube—MY LAST ONE, hallelujah—and a cup of water). Simmer. Add dried basil, dried rosemary, a squirt of lemon juice, a pinch of red pepper flakes, and… A PARMESAN RIND. Mine was frozen. Now it’s melting, sending cheesy strings into the broth. This photo is cooking-instructional only and is not intended as art. 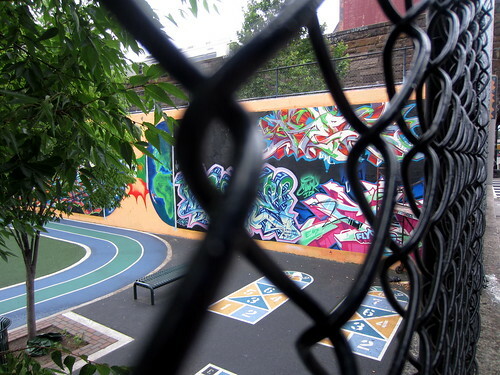 For no particular reason, here is a photograph I took of a wall of graffiti in East Harlem. This tastes less like Golden Garden than I wish it did. Golden Garden is your average Chinese-American takeout place in my town on Long Island. I am in constant need of an exact replica of their spicy broccoli in garlic sauce, and this recipe is another attempt to imitate it. I more or less lived on that stuff when I was vegetarian, and have very distinct memories of reading the fifth Harry Potter while eating it. Actually I’m not sure why I was ever able to eat it again after that experience. Those emotional wounds have not yet healed. Anyway, tonight I made spicy broccoli. 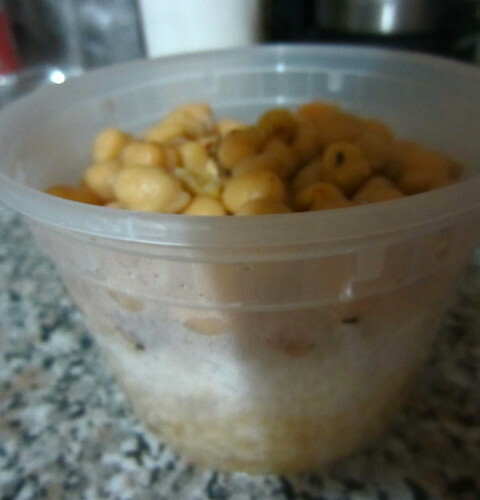 Recipe courtesy of Macheesmo (excellent blog name), who adapted it from Cook’s Illustrated, which is always a good sign. The produce-scale in my grocery store has been broken for weeks, so I couldn’t weigh my broccoli, and ended up not buying enough. I did try to weigh it by comparing it to a conveniently labeled hunk of kabocha squash, but then I didn’t feel like adding more broccoli to my broccoli bag even though I clearly didn’t have enough. So I approximately two-thirded the recipe in the end. This is the size of my broccoli-crown pieces. 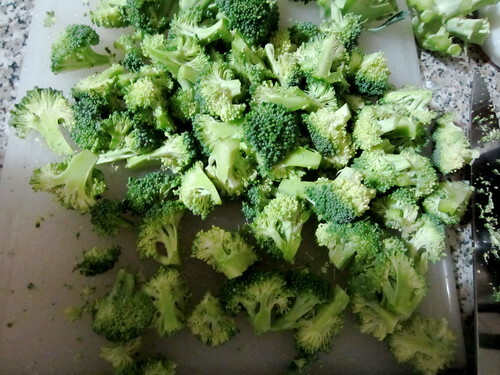 I like very small, soft broccoli bits. Here is the very belated second post of the week. While I am writing this, I still haven’t tasted it because of hopefully unfounded stomach fears… but I’ll have some soon and let you know. It smelled and looked amazing, so I think it will be fine. I had been meaning to make this for several years, but never got around to it, even after Jacqui found and bought me some whole-wheat Israeli couscous (for less than like $8/lb, which is what Fairway sells it for, blehhh). I don’t know if it’s because this happened so long ago or because it was really easy, but I can’t think of a whole lot to say about this. It was easy. 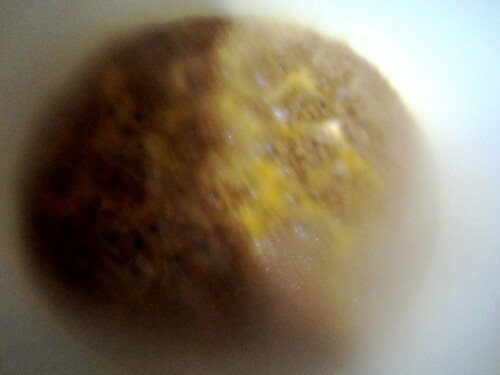 I take a LOT of pictures of steam by accident. I just thought I should check in and let you all know that I am not dead. I have one more post besides this one to share, but I am doing this one first because it’s shorter. I have developed a delightful condition in which eating any food leads to horrible stomach pain, so writing a food blog is intensely unpleasant right now. Nevertheless, here you are. 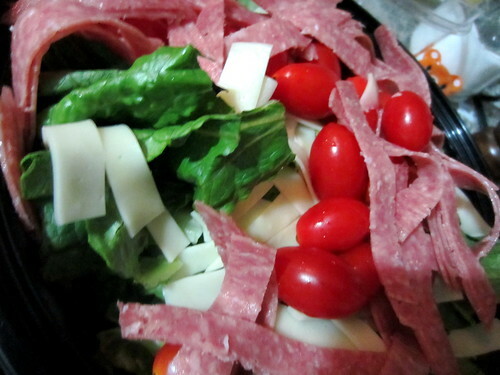 The bear (a bag clip) seems to want to eat this salad.